Puget Sound borders Seattle on the west and Lake Washington on the east, and the city is famous for its hills, forests and lakes. Historic and cultural attractions in this Washington city include Pike Place Market, the Seattle Art Museum, the Seattle Waterfall Garden, the famous Space Needle and Pioneer Square. For couples wanting to have an exclusive, romantic dinner, there are many restaurants from which to choose. Café Juanita is a romantic restaurant not more than 30 minutes from downtown Seattle that features cuisine from Northern Italy fused with American influences. It began operations in 2000 with Chef Holly Smith's guidance and inspiration. This inspiration has allowed the restaurant to garner a four stars from the "Seattle Post Intelligencer," as well as recognition from "Esquire," "Gourmet," "Food & Wine" and "Travel and Leisure." The ambiance of the restaurant is very amorous, with views of the kitchen garden and Juanita Creek. The food is of the freshest quality and the menu changes frequently with the seasons at this restaurant that uses organic products and local produce. The menu includes meat, fish and seafood specialties; pastas, salads and aperitivi; and a wide array of desserts in the tradition of Northern Italy. Restaurant hours are 5 to 10 p.m. Tuesday through Saturday and until 9 p.m. on Sunday. 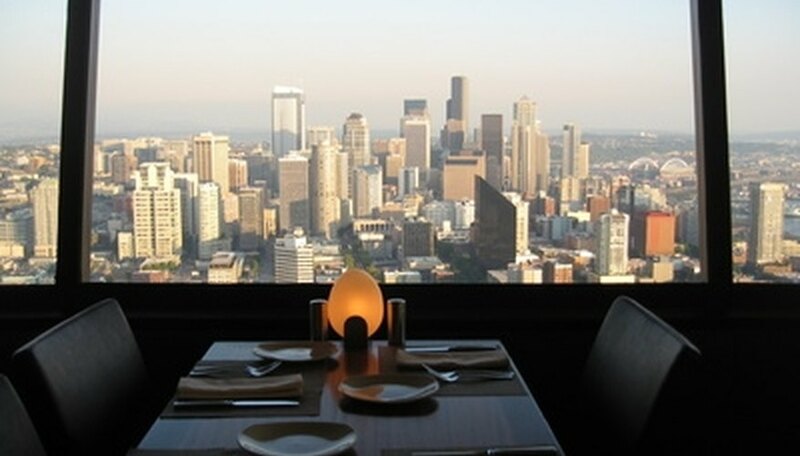 Maximilien Restaurant is a romantic restaurant in Seattle's downtown area very near the historic Pike Place Market. It began operations in 1997 and remains popular with its clientele because of its charm and beautiful scenic view of the surrounding areas, including Puget Sound and the Olympic Mountains. The restaurant offers outdoor dining on its patio and deck, which is open from mid-April to late September. The menu, which includes brunch, lunch, happy hour and dinner, features French cuisine with a local twist. Specialties include Tournedos Rossini, escargots, foie gras, steamed mussels, French onion soup and salad with Roquefort cheese. The desserts vary from crème brulee to assorted cheeses with fresh fruit. The wine list is extensive, offering both French and Northwest wines. The restaurant, which accepts reservations, is open from 11:30 a.m. to 2 p.m. and 5 to 9 p.m. Mondays through Thursday, then from 11 a.m. to 10 p.m. Friday and Saturday and from 9 a.m. to 9 p.m. on Sunday. Canlis Restaurant is an artful fine dining restaurant perfect for couples on a special occasion. It enjoys a warm ambiance with outstanding architecture and live piano music. The restaurant has received citations from numerous magazines such as "Town & Country," "Seattle Magazine" and "Gourmet"---which awarded it 19th place in the top 50 restaurants of America. The menu, which focuses on Northwest cuisine, uses the freshest ingredients. Appetizers, entrees and desserts include prawns, steak tartare, king salmon, live Maine lobster, Muscovy duck, Grand Marnier soufflé, and Mille-Feuille. Canlis' wine selection is impressive, with its 18,000 bottles and 2500 selections; additionally, five sommeliers are on hand. The staff encourages reservations, especially for Friday and Saturday. The restaurant is open Monday through Friday at 5 p.m. and Saturday at 5 p.m. Attire is formal. Perry, Edward. "Romantic Restaurants in Seattle." Dating Tips - Match.com, https://datingtips.match.com/romantic-restaurants-seattle-6100192.html. Accessed 22 April 2019.